The Research Center for the Americas presents a panel for undergraduates seeking to apply for research opportunities. The panel consists of faculty members, graduate students with experience mentoring undergraduate researchers, and two undergraduate students who have conducted research. 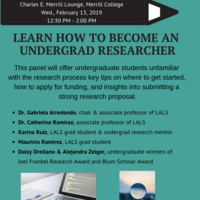 This panel will offer undergraduate students unfamiliar with the research process key tips on where to get started, how to apply for funding, and insights into submitting a strong research proposal. Dr. Gabriela Arredondo, chair and associate professor of LALS; selection committee member of the Joel Frankel scholarship. Karina Ruiz, LALS graduate student and undergraduate research mentor with the Cultivamos Excelencia Research Scholars Program. Mauricio Ramirez, LALS graduate student and recipient of the Vice-Chancellor for Research Graduate Student Grant, UCSC. This event is organized and moderated by our RCA undergraduate interns Luis Diego Ramirez and Andrea Rosas Herrera.